Cryptomundo » Montauk Monster: Raccoon? Something strange indeed did wash ashore at Montauk Island, New York. Is the “Montauk Monster” nothing more than a raccoon without an upper jaw, as proclaimed by local officials? See below. This entry was posted on Wednesday, July 30th, 2008 at 4:21 am and is filed under Breaking News, Cryptomundo Exclusive, Cryptotourism, CryptoZoo News, Cryptozoologists, Cryptozoology, Out of Place, Photos, Pop Culture. You can follow responses via our RSS 2.0 feed. You can skip to the end and leave a response. Pinging is not allowed. That sure looks like it could be a pug dog. The eyes face forward and the general shape of the body. Looks like a wingless Griffin to me. Okay, I could see raccoon (but this thing still ran through my dreams). Anybody considering DNA testing, maybe? Sorry to double post — google an image for ‘raccoon skull’ — there are a few sites that show raccoon skulls in various stages of decomposition, and it becomes pretty plausible. That plus the slightly stocky build (even accounting for bloating), long tail (which would be very ratlike without fur) and short folded ears. Still want to hear about any testing or other further research. Given the general appearance of the body proportions I could also imagine that it is a decomposed badger. The hindquarter seems too massive for a dog, so I would say either a racoon or a badger. The teeth shows clearly that it is or was a Carnivore, so there are not much possibilties for its idendity. I don’t “see” a raccoon at all. Those elongated legs for one, the raccoon also has a slightly humped back. What is the strap like thing on the front right leg, some sort of tether? The funny thing is the “looking for a restaurant’ ad on the newspaper page below the story. After looking at the body pic you hardly think of fine dining. I’m still curious why everyone proceeded to identify the carcass instead of question the authenticity of the picture. Questioning the picture is the usual line of thought in the rare event that a clear picture of a hominid, felid, canid or lake monster emerges. Was this choice due to cognitive psychology, a feature in the picture or the circumstances in the story? A new Gawker post suggests it’s viral marketing for The Cartoon Network’s new show Cryptids Are Real. It’s not without precedent for the network…remember the Aqua Teen Hungerforce “bomb” in Boston a couple of years ago? I think that skipping the veracity of the photo is because not a single person (including a number of folks who follow this and write extremely convincing analyses of photographs) have said a peep about why they think it’s Photoshopped. Lots of cries of Photoshop! but not a single thing about what makes them think that. There’s always a healthy dose of reality that suggests that it COULD be photoshopped — but I’m no expert at photo manipulation, so I must rely on others to tell me that it is. @Sluggo — I’d like to know what that strap thing is on the front appendages, too — I really, really hate to think that whateverthisis died at the hands of some sick freak who tied its legs together and sent it for a swim. Hard to tell from the position of that carcass whether it would have had a humped back or not (it’s not laying in a very natural position) – and the same decay/damage that made the nose look like a bill could very well have damaged the legs/arms/paws, as well. Not saying you’re wrong and I’m right, only that it’s hard to tell from that photo. (I was only going by the shape of the head compared to photos of raccoon skulls and the long skinny tail, as both of those are fairly clearly visible). I still don’t think it’s a dog, even if the front is starting to decay I looked up pictures of canine skulls through google and found some that are angled about the same and they just don’t look similar except for the lower jaw, maybe it had a deformity? Who knows, I’m starting to lean towards the viral marketing suggestions (even though I would love to be proven wrong). If it were smaller I would suggest some sort of embryo – even birds can have tooth-like structures as embryos. Hey, maybe it is just another mangey cyote… But I agree the bonds look suspicious. Escaped experiment gone horribly wrong? I’m sorry, but there is no way that thing (whatever it is) is a racoon. It could be a dog, but then it would have to be a totally deformed dog. In all, I’d rather go for canine than a raccoon. It can’t be a shell-less turtle, I’m afraid. Turtles’ spines are attached to their shells, and therefore they can’t be de-shelled. The right front paw seems to be making a defiant gester. Maybe someone will be curious enough to provide futher testing. Either way, it should not be all that difficult for trained person who can get their hands on it to make a determination. …and on that front I stumbled upon this (quite possibly ludicrously overblown and scare-mongering rather than based on ANY facts whatsover…) group in Facebook… an interesting aside i thought. You probably solved this mystery Aphillos. I agree with captainnemo, I think that this could very well be the body of a pug. I have two pugs, and it is the first thing I thought when I saw this picture. They are fairly deformed looking dogs, skull wise, and the body shape is just like that pictured. If the upper lip was to rot away, I imagine a dead pug would look very much like this. The only problem I have with this idea is the tail. Pugs have very tightly wound, curly tails, however they CAN straighten it out when they want to. I’m not sure what happens to their tail when they die, maybe someone here can tell me. If a pug’s tail relaxes upon death and straightens out like we see here, then I’d propose a pug as a candidate for what this creature might be. Those paws don’t really fit in, but as others have said, sun and decomposition can do strange things to a carcass. 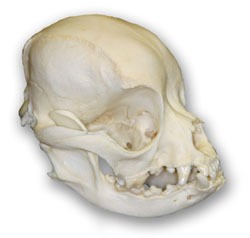 I found a pic of a pug skull on google, and while theres a few differences, mainly the forehead on the mystery creature slopes a bit too much, i think it’s kind of probable that it is a pug or some sort of crossbreed. Im no expert but couldnt this be a turtle without a shell???? A turtle can not crawl out of it’s shell (because the shell includes portions of the ribs. There seems to be very long claws and at front paws. 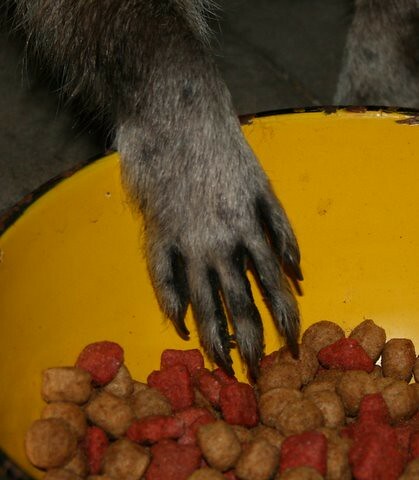 Such claws are not seen in canines (only pathological) and also not in raccoons, but they look exactly like the long strong claws of a badger (which would also fit overal body-shape, limb proportions and dentition). For comparison the shorter and curved claws of the raccoon which is much more a climber than a burrower.